Hospice care is the active, expert and gentle care of people with serious progressive illness when cure is not expected. It includes support to individuals who are care giving for someone at the end of life, and to those who have suffered the loss of someone such as a family member or a friend. The terms Hospice and palliative care are used interchangeably in most parts of Canada. 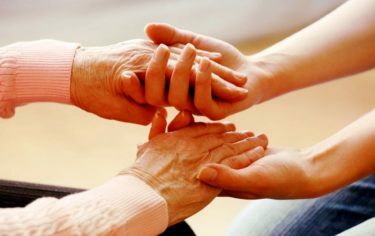 Hospice palliative care, or comfort care, is an integrated program in which expert physical, social, emotional and spiritual support is provided to patients and family members coping with advanced illness, death and bereavement. How to access our Hospice Counselling or Bereavement Services? People may refer themselves by calling the NICCCS main office or be referred by an agency in the community such as: Home and Community Care, hospital staff, social workers, physicians, Victims Services, the Crisis Society, Mental Health, School Counsellors, general practitioners, psychiatrists, friends and family. Who becomes a hospice volunteer and how are they able to help? Hospice volunteers have a wide range of life experiences and skills that enable them to offer assistance and supportive care to meet the special needs arising out of the physical, emotional, spiritual, social, and economic stresses which are experienced during the final stages of living, and during care giving and bereavement. How much training do Hospice volunteers have? Hospice volunteers are required to take a 40 hour training program based on provincial standards. Hospice volunteers have excellent listening skills, and receive training in group facilitation and/or one-to-one support that enables them to provide companionship and support to patients and families in their homes, in hospital, or in care facilities. Hospice volunteers sign a pledge of confidentiality and undergo an RCMP security check. NI Crisis and Counselling Centre Society is now accepting applications for volunteer to provide palliative and bereavement support to a patient who has a life-threatening or condition and their family and friends. Volunteers are also being sought to assist with fundraising for this valuable service. Volunteer education sessions begin late September 2017.